In the fast–moving and fickle world of mobile apps, users have a tendency to lose interest in their new downloads quicker than a Snapchat story expires. The huge number of apps that each of us downloads every year is both a blessing and a curse: predictions for 2017 suggest that there will have been 197 billion app downloads worldwide this year. With so many apps becoming part of our daily lives, that leaves little time to be looking up at billboards or down at newspapers - so making your brand visible means getting your icon or logo onto people’s screens. And when so much is at stake, it’s no surprise that the costs of making that happen continue to grow. An average of $8.21 is spent for each app user who creates an account, even though a startling 25% of these users will open the app once and then disappear forever. A recent article from eMarketer highlighted the cost of acquiring mobile users – or, more accurately, the cost of losing them. From that $8.21 per new user, the cost escalates to $64.96 per user for those who actually make a purchase, which implies a conversion rate from acquisition to purchasing users of just 5.4%. Getting users across the line from initial install to becoming a regular purchaser is no easy feat, but it’s the latter users that are the difference between making a loss and a profit. This means that in order to increase ROI there are two key objectives: to increase the average revenue that each purchasing user generates (for more ideas on this, see our blog post), and to reduce the cost of each of these users. Reducing the cost per user can be approached either by optimizing the acquisition process, or by focusing on keeping existing users clicking, playing, swiping and buying. Taking acquisition first, it’s an open secret that this an uphill battle in a marketplace packed with apps all competing for potential downloads, and there are no quick-fix solutions. On that basis, it’s probably fair to assume that the second option - reducing user disengagement - is the smart (and cost-effective) solution. After all, if you kept losing your car keys, you would buy a key finder rather than continually getting them replaced. Increasing that 5.4% download to purchase retention rate by even one percentage point translates to an uplift of 18% in purchasing users and a corresponding uplift in revenue. And that kind of shift is absolutely possible. Take the example of this Swrve case study, in which a major global publisher achieved an increase of 46% in Day 7 retention rates. The app in question boosted early engagement through redesigning the onboarding screens, and optimising push notification campaigns to encourage opt-in and app use in the crucial first days. 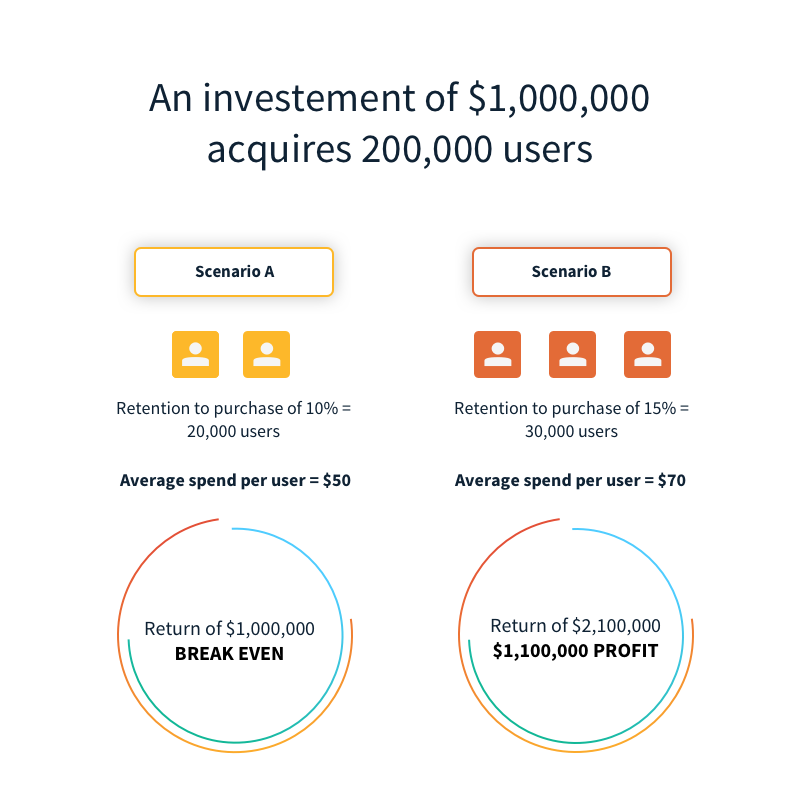 To show just how powerful this approach can be, let’s imagine that a company spends $1 million to acquire 200,000 new users, of whom 20,000 spend an average of $50. The result is an app that breaks even and, as a result, has a limited lifespan. More importantly, spending more money to acquire more users isn’t going to fundamentally change that arithmetic. But if smart campaigns like those seen in the case study above are applied, the percentage of customers who make a purchase could realistically be increased from 10% to 15%, and the average amount spent by each customer to $70. The results of those shifts are compounded, to the extent that the same app then generates $2.1 million, with a highly respectable $1.1 million profit. With acquisition a notorious drain on budgets and churn rates so high, it’s clear that the real value, and real ROI, comes from investing in the customers who have already made that all-important download. Getting space on someone’s phone screen is just the first step: staying there is the key to success.